DPMSRECON308, Sunnier, Milkman and 3 others like this. DPMSRECON308, driverdog and Newm like this. DPMSRECON308, Noodle, driverdog and 1 other person like this. Noodle, driverdog and Newm like this. Blacked out the badges. Plastidip is a beautiful thing. Boardude has got some front bumper corners coming my way and I appreciate it a ton!! solid guy out there in Arizona!!! Here is my 2018 SR5 TSS fresh off the lot this week. Lots planned for this bad boy! DPMSRECON308, driverdog, boardude and 2 others like this. New to the group. Retired/ upgraded my modified 4th gen 4runner to this 2018 Tundra.... Had to have this color! DPMSRECON308, Sunnier, monaco730 and 2 others like this. DPMSRECON308, Newm, SedatedDreamer and 3 others like this. My 2017 SR5, Revtek 2" lift, 295/65 18" Good Year Duratrack's. Love the Inferno!! monaco730, Newm, Sunnier and 4 others like this. DPMSRECON308 and driverdog like this. Marty McFly, Newm, driverdog and 3 others like this. 3/1. Toyo MT 295/70/18. Fuel Assaults +1 offset. 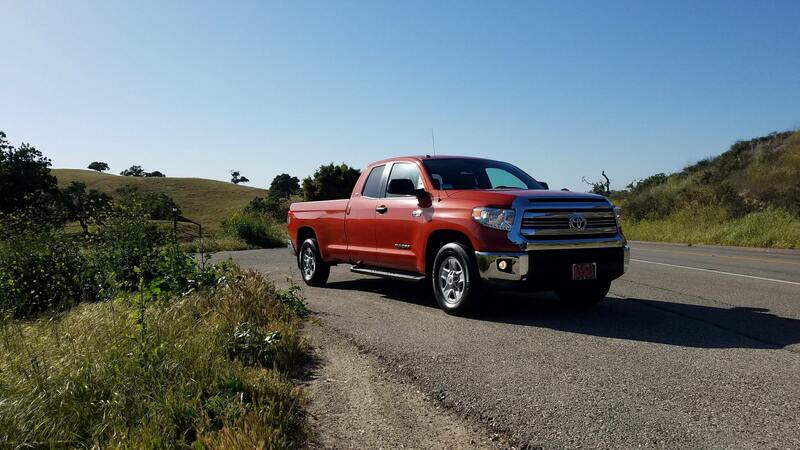 My 2016 Tundra. Chomping at the bit to fit some 35's and some fuel assaults (18's I'm hoping). I did this small lift a few months ago and I love it. Those stock wheels and tires gotta go. Toyo MTs are soonish. Newm, Sunnier, InfernoToyo and 3 others like this. Nice truck and love the color. Please introduce yourself in the new member forum. Updated photo of mine. Still saving my pennies for a color matched Pro grille! I'll probably just end up plasti-dipping my bumper end caps until I can afford a full replacement bumper. Diverguy, DPMSRECON308, Newm and 2 others like this. Rob's Inferno, DPMSRECON308, monaco730 and 3 others like this. A quick moving cold front produced this sky moments before the rain came. monaco730, Diverguy, DPMSRECON308 and 3 others like this. monaco730, DPMSRECON308, driverdog and 1 other person like this. These moments lasted maybe 3 minutes. By time I got into the parking lot and took these pictures it was already less dramatic. After I took these pictures I didn't even make in to Walmart before the deluge of rain hit. I will add that it was surreal. The iPhone did a pretty good job of capturing the strange and Erie lighting. One direction is east and one is west. The sky was lit up! Something We'll remember always and glad to have captured a piece of it and to share here! InfernoToyo, DPMSRECON308, boardude and 1 other person like this. InfernoToyo, DPMSRECON308, Newm and 1 other person like this. The pollen is so heavy my Tundra is looking like a large chia pet! My first post, and the first longbed in the thread? driverdog, Newm and Sunnier like this. Newm and Sunnier like this.